fRoots has a digital edition that is fully readable online or when downloaded to your computer. On desktop/laptop computers, here’s a fully viewable sample of the whole January/February 2016 double issue. Click to see a free view of how a full issue of fRoots appears in digital form. To see the iOS/ Android version for iPads and other tablets and smartphones, download the the App from the Apple NewsStand or Android store onto your device and you can also see this same sample issue free. As you will see, it’s exactly the same as the printed edition of the magazine, with working web links throughout the editorial and some adverts. From the December 2013 issue onwards it is now available free to ‘paper’ subscribers. All current ‘paper’ subscribers for whom we hold email addresses have been sent an email telling them how to access their new free digital edition. If you are a current subscriber and have not received this email or never provided us with your email address, contact Beverly Hill at sales-at-frootsmag-dot-com to get yourself activated. Digital subscriptions offer great savings for overseas readers who may find the extra postage costs of the paper magazine prohibitive, or are concerned about the environmental costs of shipping chunks of processed tree around the planet. It’s also a slightly cheaper alternative for UK readers who don’t have space for storing magazines. Digital-only subscription rates are £32 for one year or £60 for two years. We also have a special UK student rate of only £16 for one year, for those under 25 and in full time education in the UK. Subscriptions to only the iPad/Android versions are also available as in-App purchases along with single issues. Digital subscribers do not receive free sign-up/renewal incentives such as CDs or back issues – i.e. nothing gets posted at all! The tracks on the free fRoots compilation albums with some issues are available to digital subscribers as a downloadable Zipped folder of mp3s plus artwork, accessed from a link within the digital edition. Secure access to digital editions is limited to a maximum of 5 computers/ devices per issue/ subscriber. All paid-for issues will continue to be readable in perpetuity with your log-in and password, even when subscriptions expire: we recommend you to download them. Digital subscribers – access your editions here. New subscribers, continue below. 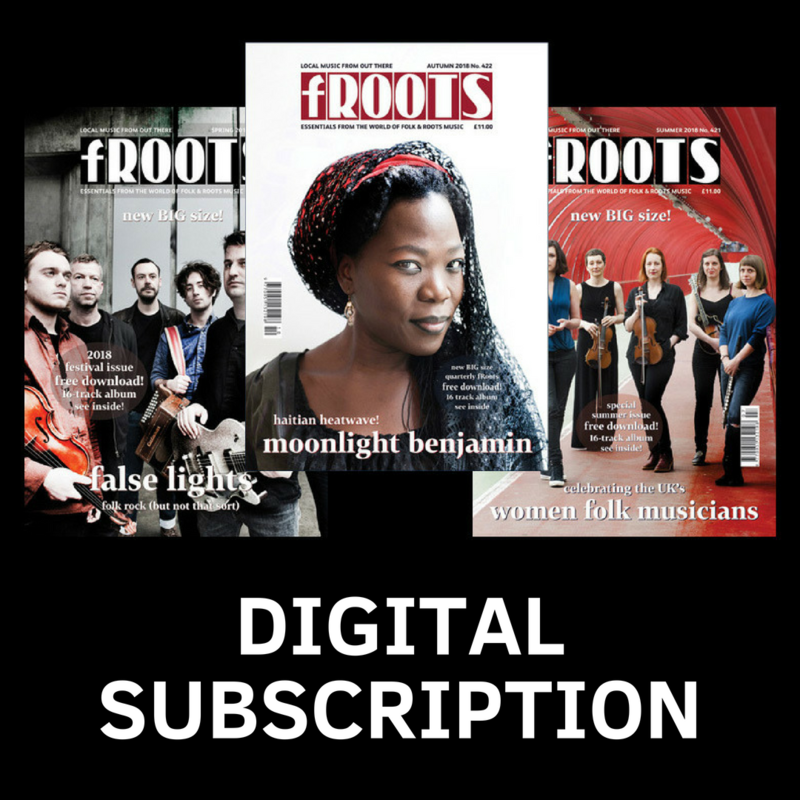 One year fRoots digital subscription. New digital subscriptions start with the current issue unless you tell us otherwise. Renewal reminders will be emailed to the email address used to purchase the subscription. Digital magazines bought and downloaded continue to be available to the subscriber after a digital subscription expires, subject to restrictions on the number of computers on which they can be read (initially 5).